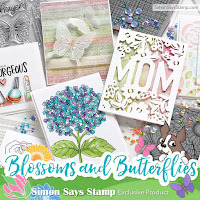 It has taken me almost a whole year to get this Simon flower stamp set - it seemed to be constantly sold out. But I finally snagged myself one, and here is my first card using it. The Nuvo drops in all 3 colors match the distress inks perfectly! This is your favorite week of the month - you can make anything you like! 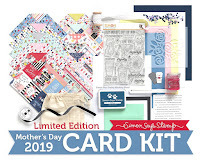 The team is using Carabelle Studio products this week, and if you have any, we'd love to see your creations, too, but that isn't necessary to play along. If you're like me, you've had enough of winter, so I chose a big tropical leaf stencil and made a card that makes me feel warm and relaxed. I started by securing my stencil to a piece of white cardstock, then colored in the leaves using the 3 distress inks. That panel was then trimmed. Next I die-cut the big Hello from the panel, along with 4 white ones, and glued them all together. I stamped the little sentiment and then the stenciled panel was attached to my card base, adding my big hello. To finish, I made a big Tammy Tutterow flower, holding the 4 layers together with a brad, and attached that to the upper part of the card. 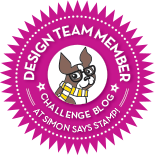 Here's a card using the Simon Says Stamp February Card Kit! 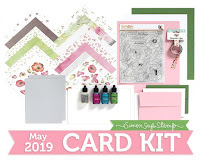 This stamp set has some really fun sentiments, and the kit includes adorable embellishments, especially this Coffee Love die, and some Doodlebug Latte Love epoxy stickers - can't wait to play with them next! It's coming up on my favorite time of year - Valentine's Day - a day when I can let the people I love know I'm thinking of them. I've been missing my mojo the last few weeks, but I think it may be returning, as this first card generated 2 others! 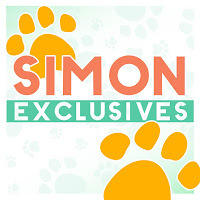 Stay tuned - hopefully there are more to come! Thanks for visiting today. Here's a fun card, using a Hero Arts Color Layering set - I paired it with a stencil. Not sure that flamingos live beside the ocean, but this one does! This multi-step flamingo is really fun to stamp and it layers easily, too! I had fun putting together this scene. Hope it makes you smile. 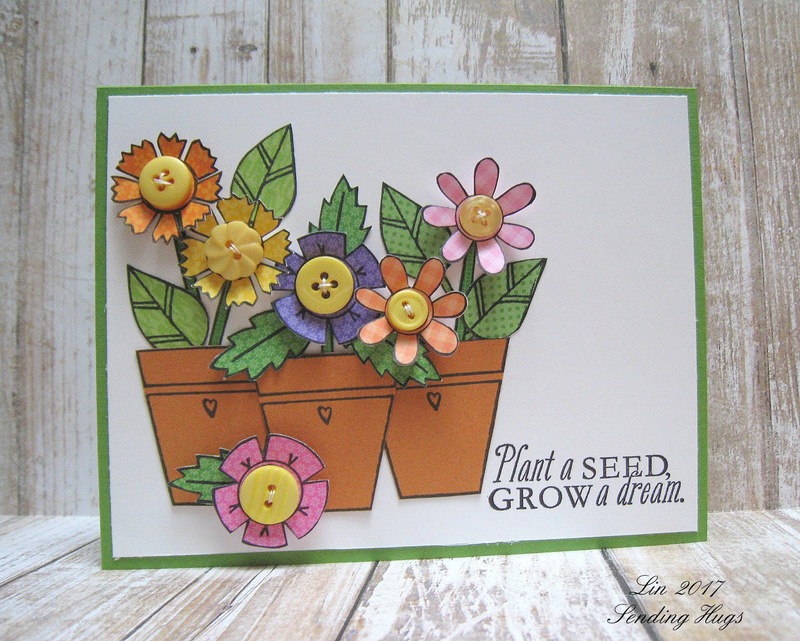 Welcome to my blog - today I have a card being featured at Tammy Tutterow's Five for Friday semi-monthly feature! Today I played with her Posie Parts stamps. I decided to stamp on petite prints design papers; their scale is perfect for these smallish parts, and I love the selection of color each pad gives us. I fussy-cut all of the elements - it's something I enjoy doing anyway, and having all the little pieces to play with is much easier, in my opinion, than masking would have been. To add some dimension to this otherwise simple design, I sewed on buttons to the centers of the flowers, and pulled up the petals. 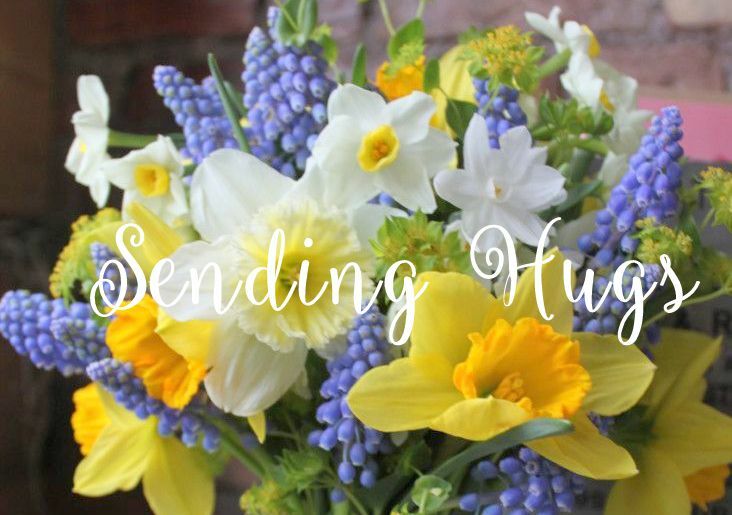 This was fun to put together, and brought a little spring into my life until the real thing shows itself! Our theme this week is "Anything But a Card", and we are using We R Memory Keepers products. These snowflakes dies make a partial cut, so that everything remains attached. Since I have a cuttlebug which cuts only 6" wide at a time, I needed to trim my glassine to that width, and I also added a 2nd width of 2 1/2" at the bottom. The top panel was cut randomly, and on the bottom one I lined up the medium sized snowflakes. After making my cuts, the snowflakes were pulled outward, and then I secured the glassine strips at the back of my luminary. Wouldn't a group of 3 of these in different heights make a pretty table centerpiece? There are 6 colors to choose from in this pack. I chose the aqua, but I think this would be fun to do in green using the new Simon Partial Cut Leaves, or in any of the other colors with flower dies! Just checking in with a card that I made for our granddaughter's birthday later this month. Last fall, I won a stamp set of my choice from Your Next Stamp, and I chose this darling set that features lots of cute woodland critters. I'm very impressed with the quality of these stamps. 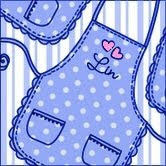 I have another card today using some of Tammy Tutterow's cling stamps. I love this doodled frame stamp that Tammy calls Simple Line Border - it's a great way to add a little interest to a one-layer card! And this main stamp with the sweet flower pot and gorgeous written sentiment will be so useful for lots of different occasions. Thanks for stopping by today - I appreciate your visit! Our theme this week is "Winter Birthdays" and my teamies and I are playing with Lawn Fawn goodies! This adorable bird set has been a favorite of mine since it was released a few years back - hope they never retire it! Since these papers are mostly in blues and greys, I followed suit when I colored the birds. The blue plaid panel and the fussy-cut birds are popped up with foam squares. 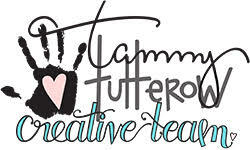 Today is another of Tammy Tutterow's Five for Fridays, where her creative team shows off some projects that we've been working on during the month. I have 2 cards today using some of Tammy's floral cling stamps. I colored the sweet bouquet , cut it out, and then inserted the stems into my vellum canning jar before attaching it to the framed rectangle. I use any excuse I can to use gingham, so this panel was brought in to pull out the yellow in the sunflower - the scale is just right! 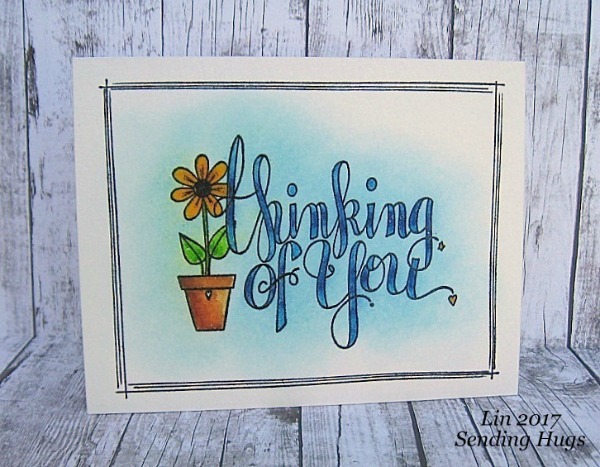 I stamped the sentiment using my handy mini Misti in the center of my card, then stamped the Flower Swag above and below it. Easy peasy and nice and flat for mailing! 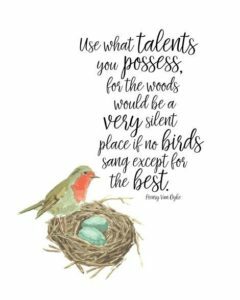 I hope you'll visit Tammy's blog to see what my other teamies have made this time - we all have such different styles, it's really fun to see the variety of projects! Happy New Year and welcome to our first challenge of 2017 ! 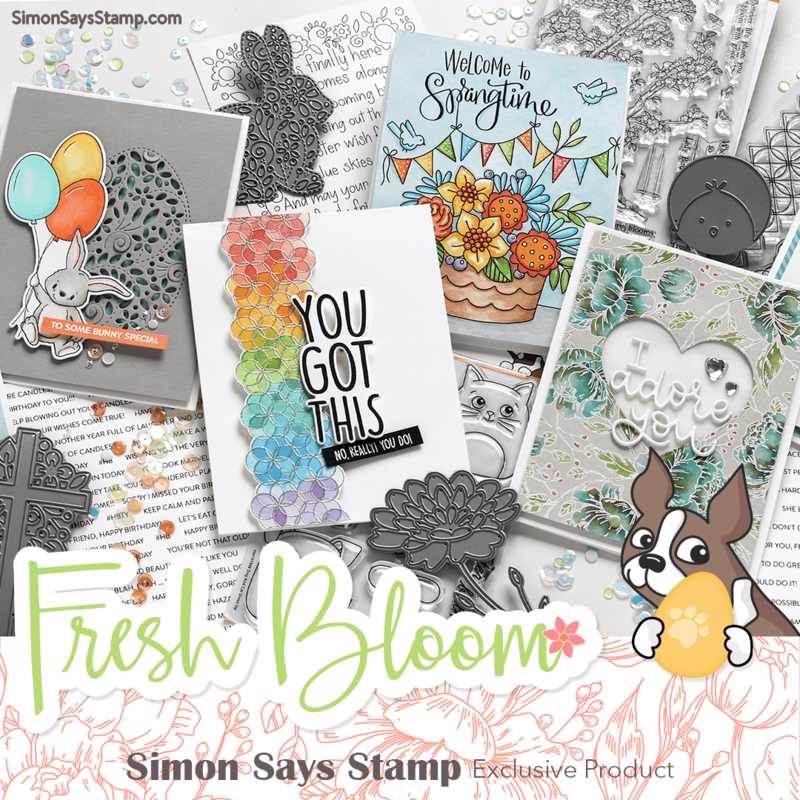 Our theme this week is "New Somethings" and the team are showcasing Simon Says Stamp exclusive products. My "new" is a set of Simon rose dies from the last DieCember release called Hey Love. I die-cut them once and made 2 cards from them, using the positive and negative die-cuts. This first one uses the negative die-cuts, and some papers that I made ages ago using the polished stone technique (pouncing alcohol inks on glossy white paper). I love how this one appears to have been stenciled, but I just used the positive die-cut as a spacer to insert my negative pieces, gluing them down one by one, then removing the outine die, which I then used on my 2nd card below. I used another "new" crafty item on this last card, the lovely Garden Party embossing folder.